Inside America helps students learn to use English effectively within American culture. Informative video units illustrate everyday life in the United States. Each unit begins and ends with a candid interview in natural, authentic speech. The book is packed with activities for the classroom and the community. Using the language in many contexts, students learn how to interact successfully with native speakers of English. Who benefits from Inside America? People overseas who are about to live, study or work in the U.S.
How do students use Inside America? How will Inside America meet your students' needs? A. Inside America shows real life in the United States, not a Hollywood version. The video is packed with scenes of average people in their daily lives. A. Inside America is filled with high-interest activities that prompt students to speak English on the phone, in community contact assignments, interviews, oral research projects, service learning contexts, team work, and in many other practical situations. A. 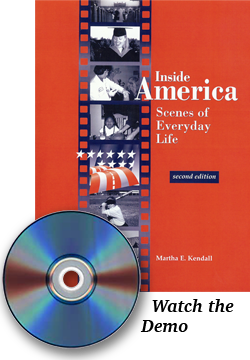 The video, book and activities in Inside America engage students with visual, auditory and kinesthetic learning preferences.